So, here is a world premiere, but more about this if you read on. Apart from transport boxes or windows in my apartment, my cat didn’t know the outside as she always has been a house cat. But now that I am at my uncle’s house for a while again, and due to the fact that there is a terrace, I wanted to show her the outside. Today was a sunny day, there was boredom, and I thought I do her something good and I showed her the terrace. I always planned something like this, if it wouldn’t have happened here, I would have done this at home in our garden some day. She’s vaccinated anyway, I was more concerned about fleas and ticks, but I thought the risk would not be too great on the rattan couch and pavement, and even if so, it wouldn’t be the end of the world as I could do something afterwards. I had a cat leash with me as I knew about the terrace, I purchased this nice leash a long time ago, and even if we never went out together, we practices already with the leash a few times at home at that time. I was always a bit concerned if I really should show her the outside, because she could like it too much, and then I would have the problem that she never would be happy again inside, but as said, there would be possibilities as we rented a garden in our hometown anyway, and it would be possible to be outside with her at times. At home, my apartment has no balcony, but I plan to move to a better apartment sometime next year if I am less busy, and I will not be able to afford an apartment with a terrace but a balcony would be possible, and then I would have the option to enjoy the time together with my cat on the balcony. However, as long as I still in a house to help my uncle a bit, I thought it would be a chance to give my cat a new experience and we just went out on the terrace with the leash. To my surprise, my cat absolutely didn’t like that experience at first. I mean, dislike is maybe the wrong word, but I’d say she was quite overwhelmed with the experience. I tried to understand how it would feel like for her, and even if she listened to several sounds in the past when she sat near the windows, it must be a total different experience for a house cat if she is outside the first time. I sat on the rattan sofa with her, and there was a bumblebee, two wasps, the sounds of birds from all directions, the noise from the street close to the house and so on. A lot of impressions at once, and sadly it was fathers day, my cat panicked a bit when a group of totally drunken and noisy people passed by the footpath behind the house with a handcart loaded with shaking and clanging beer crates and an impressive subwoofer. 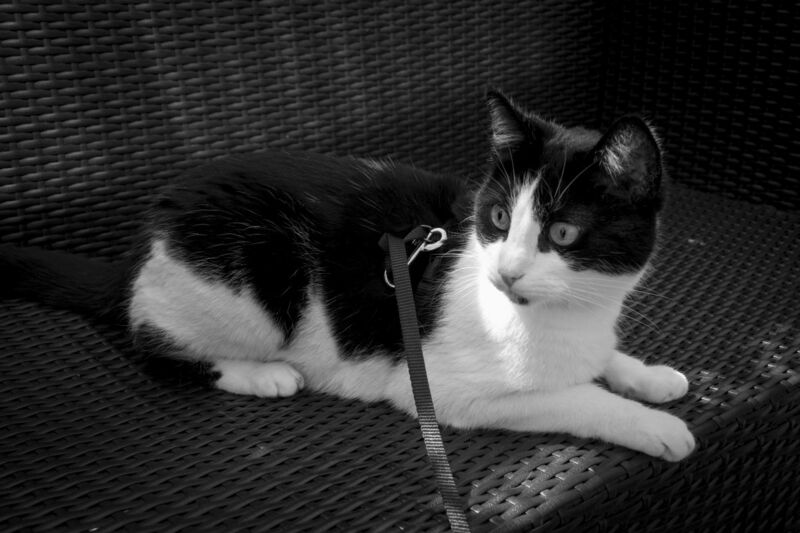 When the second group passed by, my cat had enough of the terrace, she drew me back inside with the leash, and we took a break. If you are new to my blog and if you like her, take a look at all the other Shyna photos, or browse all my other cat photos and stories. When it’s not too loud or frantic, nothing is like warm sunny spot with outside smells and sounds for a cat. Snoozy times. RC Cat, however tends to race to the top of the tallest tree if given a chance and we live in a migratory bird sanctuary zone so she can’t hang out outside without a tether (which annoys her no end as she was wild and free before we captured her as a kitten). Enjoy the cat naps! cats and leashes – like oil and water. But even RC will tolerate it if the lead is long…and she thinks she can wiggle out of the harness when we aren’t looking. HA! Not a chance – we trees too tall for us to reach her. Shyla, you beautiful girl! I’m wanting to draw you all over again! Or wait, did I spell her name wrong. I think it may be Shyna. Sorry Shyna! And Dennis! She certainly looks very alert and aware of her surroundings. When we first started to let Polly into the back garden she would run inside at the slightest unusual sound, even birds flying overhead were enough to send her running for cover. Over the past year she has gained a lot of confidence though. I think that she is braver now that she can see the length of the garden, with the old shed gone she has a view of the open back door at all times and ventures further away from the house. As I’ve said before the danger is that she could get to like it too much but as long as she doesn’t learn to jump on the fence or climb the apple tree she will be safe and I am always watching her. Shyna may be the same and start to enjoy the terrace in the same way she does your mother’s garden. Exactly, Shyna did the same as Polly…. also she was afraid about the pavement on the terrace. To get back into the house, she jumped from the rattan couch you can see in the photo, to the glass table, and from there to the rattan armchair, and then on the three wooden steps of the terrace door (laugh). She looked as if she would jump from island to island, I had no idea what she disliked about the ground (laugh). Yes. it’s my main concern that she could start to like it too much, because there would be chances, but most of the time she will be in my apartment again at some point, because of course I can’t be outside with her all the time. My concern is still big, because I know from reading that SOME cats can start to pee everywhere in the apartment if they are unhappy with something… Shyna never showed her discontent on this way, and I never want to see this behaviour. One of my friends had this happen with his cat always at the days he was working and when the cat was alone (unhappy to be some hours alone). Eventually he brought his cat after many tries to solve the issue to the shelter and had to renovated the whole apartment. As much as I love animals, I understood him, because he got into trouble with his landlord, and a cat should be able to be alone for a work shift. I always told myself that I never would give away Shyna, but this is a rare case where I would do this too if I would not be able to solve it, even if it would make me and Shyna sad… so, stories like this one make me feel a bit uneasy if I let her out. I think at the moment it is still very new to her and she is a few years old so used to being mostly inside so it should be alright. Polly obviously still feels that inside is the safe place to be most of the time. Funnily enough she didn’t mind walking on concrete but would not walk on the grass when I first let her go out. She will walk on it now but does tend to keep to the paths. That is a great photo. It looks good in black and white. My cat Frankie didn’t like the harness at first and I had a very hard time getting it on him but he soon associated it with going outside and he became much more cooperative. Did you notice any behaviour that Frankie demanded to get outside more often? I am afraid that Shyna could start to be unhappy inside and that she would show bad behaviour like trying to get out of a tilted window, or even showing discontent in other ways. Of course it will not always be possible to let her out, when I am at home again, there it’s just an apartment without terrace. Frankie always wants to go outside but after I started taking him out he got worse. He would spend a lot of time at the door crying. I don’t take him out as much anymore and he is not as annoying now. Thanks Charles, that was one of my concerns. I think I shouldn’t do this too often either, because I can understand if they start to like it and become annoying if they don’t get out. It is too bad they have to behave badly because going outside is good for them. Lovely shot of Shyna, and the story does have such a fine feel to it. With all the new things that she has no real knowledge of it would both satisfy her curious nature and perhaps baffle her by the complexity.